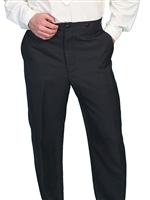 The Gentlemen's Trousers feature a button fly, two side pockets, adjustable back strap and suspender buttons. They are made of a poly-wool bend. Only available in black and sizes 28-48. Please call for availability.